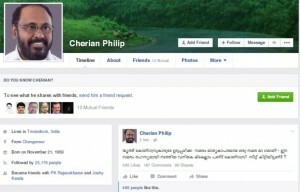 Kottayam: Cherian Philip who is a political observer and left fellow traveler has kicked up a controversy with a sexist remark on his Facebook post. “The shirtless protest staged by Youth Congress activists is an imitable one. Earlier, many Congress women who staged similar protest behind doors were given tickets to contest polls,” Philip’s posted on Facebook earlier in the day, inviting the wrath of women’s activists and leaders. Youth Congress activists had recently staged a shirtless march in Thrissur in protest against the denial of seats to contest in the local body polls. Meanwhile, Cherian has defended himself saying he did not make any misogynist remark. “I have not insulted any woman personally. I respect women very much. I only meant some who are an insult to the entire womenfolk,” he said in another post. He said he wanted to criticise the men who victimise women. Cherian Philip started his political career through KSU, the student wing of Congress, and was a close associate of A K Antony. He had occupied several top posts in the party before he quit it in 2001.